With the webcam still unavailable (to me, at least) a visit in this morning’s sun seemed in order. From a distance it was obvious that one of the adults was on the very top of the church tower: even when there’s not a bird on the nest platform there’s typically one nearby. The combination of size, lack of a ring and buff-ish fringes to the tail feathers made it clear that this was the female, but she seemed in no hurry to return to incubation duties, watching a series of Woodpigeons pass below her, and even being overshadowed by something faster than she is! 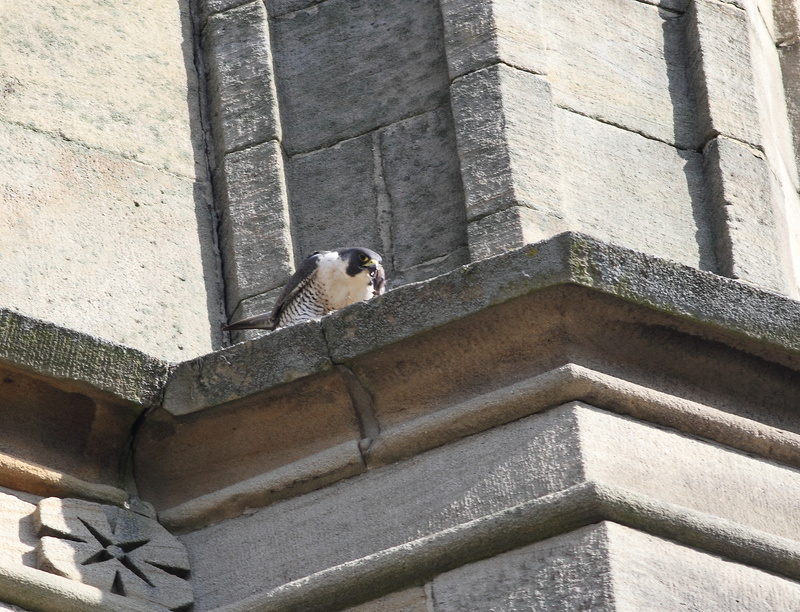 After some extensive preening, she looked ready to fly off, but I was surprised to see her drop onto the ledge that runs around the top of the church tower, where she began to pull at something. It quickly became clear that they have a larder on the ledge, where food is stored for later consumption, in this case apparently another feral pigeon, which have been found to make up over half of the diet of urban Peregrines. Another egg might be expected tomorrow (Sunday), but it may be a little while until we can be sure. 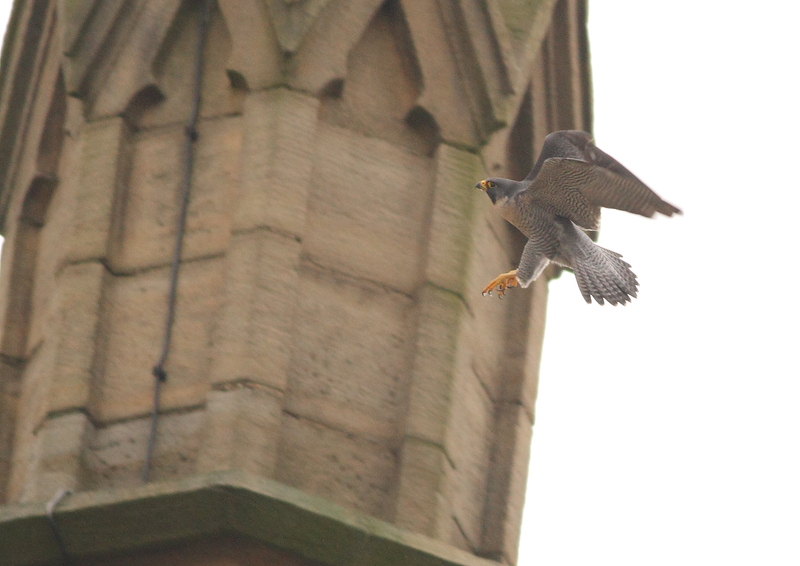 In the meantime, there are some excellent views to be had of the adults as they are stationed on the tower. They tend not to be overly active, but no less spectacular for that, as these pictures from this morning show. With a huge amount of interest in the laying of the first egg, there is keen anticipation of further developments. 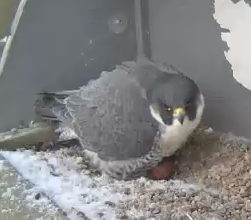 Peregrines typically lay an egg every 48 hours, so today the second egg was due, and sure enough duly appeared. A normal clutch would be 4 eggs, although more (or fewer) can also be seen; this pair laid four eggs last spring, although only two of those hatched, both fledging successfully in mid-June. It is also quite normal for the eggs not to be constantly incubated at this early stage, but once the clutch is complete we can expect the amount of time the adults (mostly the female) spend incubating the eggs to increase significantly. From then, it will be another 30 days or so until the eggs hatch, and a similar amount of time again until they are ready to leave the nest. There have been some technical issues with the webcam, which seems to be ‘offline’ fairly regularly. This is frustrating for everyone involved, but we at SBSG have no means of addressing this, though I know the team at the University are working on upgrading the streaming so that it can cope with the numbers of people wanting to watch the birds in action. It’s great that they are generating such interest, but as a result the project has become a victim of its own success! Fingers crossed for more eggs to be laid over the coming days, and for the webcam to stabilise under its new stream. A more detailed post will follow, but after increased activity around the nest site in recent days, including the female sleeping on the platform over the last couple of nights, the first Peregrine egg has been laid. It is perhaps fortunate that she has waited until the worst of the snow coverage is over, although temperatures are still unseasonably cold and some snow is still forecast. 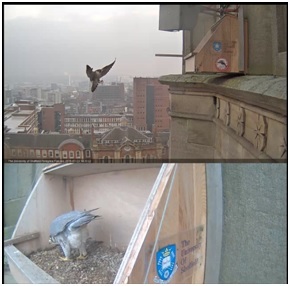 A Peregrine’s clutch size is 3-4 eggs, so keep your eyes on the webcam for any further activity, and Tweet us at @shefbirdstudy if you observe any interesting behaviour. Following the ‘excitement’ of the collapsing nest tray, it was with great relief that the birds were back at the nest platform the following morning, apparently unconcerned at the new additions to the structure to keep it all in one piece. A couple of visits to the site over the weekend enabled a much better picture of the state of play than the excellent (if sporadic) sightings from the webcam, which on Thursday morning showed the male scraping the new gravel put in place as part of the repairs. The male was perched by the platform (just out of view of the webcam) and was calling repeatedly to the female perched on top of another building a couple of hundred metres away. She was unmoved, and he made a couple of flights to her, apparently in the hope that she would follow back to the platform. She eventually did follow, but just circled without landing before heading back to her original perch. All positive signs of sustained interest in this as a nest site. The next couple of weeks will hopefully see the birds mating and – all being well – the appearance of eggs. Huge relief all round when the birds visited the platform this morning, the male busily scratching away at the gravel and then shuffling down into the depression, apparently fashioning a nest scrape. How amazing to be able to watch such behaviour in front of our eyes! Last year we suspected the eggs were laid around the end of March or start of April, so the next fortnight should see increasing activity on and around the platform. Keep the faith! The above pic is a montage of the female excavating the nest site, taken by the Estates team. It’s possible some of you have been checking the webcam every now and then, and seeing nothing but an empty, damp nestbox. But have patience, because you could get views like this, which were recorded from the webcam a few days ago, as the peregrines hopefully prepare for another successful breeding year. To try and spot the peregrines live, see the webcam feed here. Good luck! 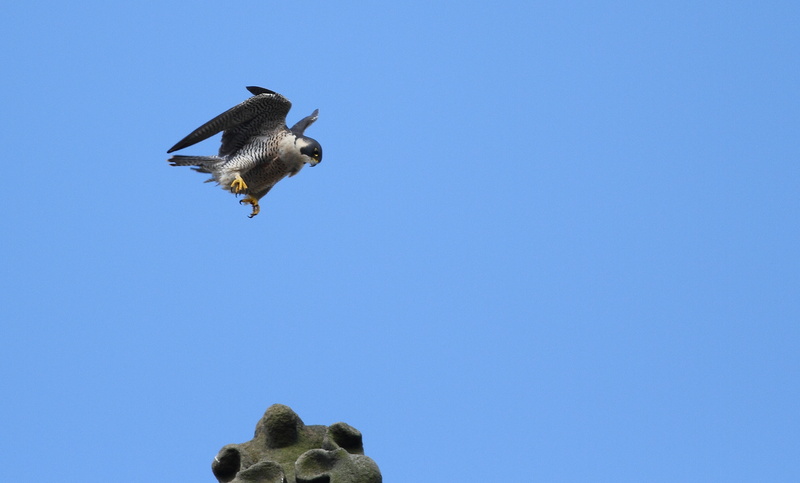 The peregrine webcam has made the news today, with a piece in Martin Wainwright’s blog on the Guardian. See here. 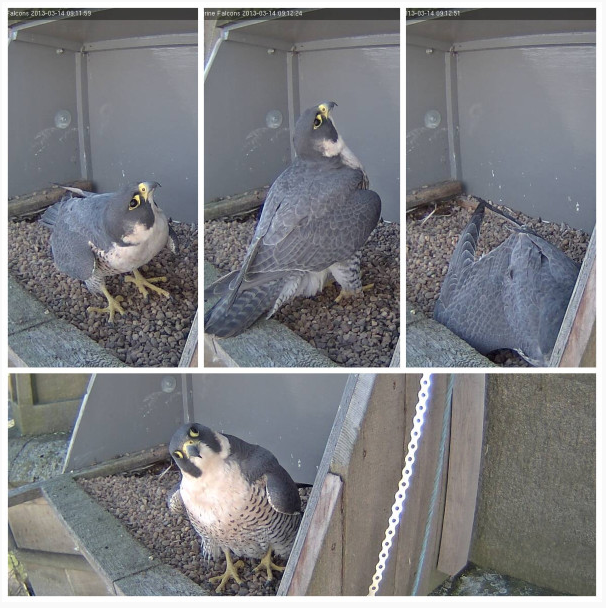 For those who have been watching the webcam and just been thwarted by an empty nestbox have patience – the birds are usually around St George’s, and give excellent webcam views if you’re lucky to be online when they enter the box. Often they’re just out of shot on the perch – look out for the edge of their tail or wings on the left hand side of the screen! 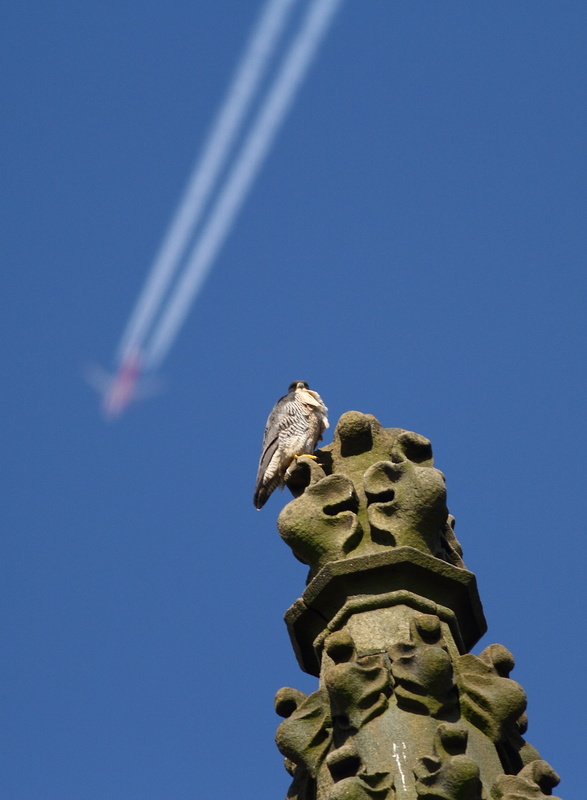 If you’re passing the church don’t forget to check each side of the tower if you can’t see them around the nestbox. 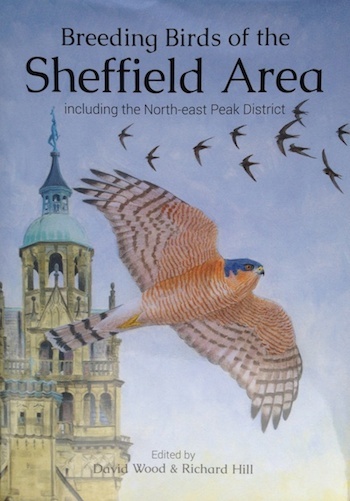 If you see the birds, either on the webcam or while out and about, let us know on Twitter, at http://www.twitter.com/shefbirdstudy.